Q. What is a Permanent Deacon? Simply put, a permanent deacon is a deacon who is not transitioning into the priesthood, hence the term transitional deacon. Just as all bishops are first ordained priests, so too are all priests first ordained deacons. Yet not all priests are consecrated bishops, and not all deacons are ordained priests. This answer is inadequate in explaining the vocation of the deacon in the Church. A deacon is cleric, a man who is chosen by God and ordained by the Church in the order of service. Hence, a deacon participates in the Sacrament of Holy Orders. In the last fifty years, much has been written about the permanent deacon and not all of it is correct or helpful. In order to put the diaconate (the order of deacon) in perspective, it would be best to look at three deacon saints through the ages of the Church: St. Stephen (the Apostolic age), St.Laurence (the first millennium), and St. Francis of Assisi (the second millennium/medieval age). St. Stephen is one of the first deacons chosen by the Apostles, and his life is truly biblical. Stephen is found in the Acts of the Apostles, Chapters Six and Seven. While only two short chapters, they reveal to us not only what type of man is Stephen but what the Church expects of Her deacons. St. Peter and the other Apostles gathered and declared that the Church of God should find seven men who are “well spoken of, full of the Holy Spirit and Wisdom” to be in charge of of the daily relief of the widows and the sick. The Roman Catechism states that a deacon is “the eye of the bishop.” “His duty is to be always at the side of the bishop, guard him while he preaches, serve him and the priest during the celebration of divine mysteries, as well as during the administration of the Sacraments, and to read the Gospel in the Sacrifice of the Mass,” and, in churches that allow communion under both species, to distribute the precious blood. In addition, the Catechism states that a deacon warns “the faithful to be attentive to the holy mysteries…and to him was entrusted the distribution of the Church goods, as well as the duty of providing for all that was necessary to each one’s sustenance.” As one reads the Roman Catechism and sees what is the vocation of a deacon, there can be no doubt that the man who sets the example for what a deacon should be is St. Laurence, who was one of seven deacons to Pope St. Sixtus II. On August 6, 257, Pope Sixtus was martyred with four of his deacons. Laurence was not one of them. Laurence wept over the pending loss of his Holy Father, Sixtus. Laurence asked Sixtus where he was going without his deacon? Sixtus responded saying, “I am not leaving you my son. You shall follow me in three days.” Laurence, filled with the Holy Spirit, was determined to give all he could to the poor before he too gave his life for Christ. When the Prefect of Rome heard what Laurence was doing he was determined to get the riches he thought the Church had and brought Laurence in for questioning. The prefect ordered Laurence to hand over all the riches of the Church and released him to collect those riches. 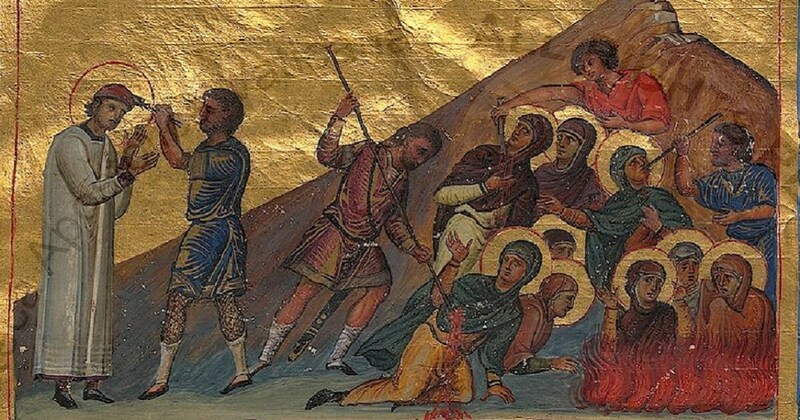 Laurence immediately gathered all the poor in the city under the care of the Church and presented them to the Prefect, saying “These are the treasures of the Church.” The Prefect, outraged, ordered that Laurence be burned alive on a grill. Laurence was so filled with love for Christ that he did not notice the pain of the flames and reportedly said at one point, “I’m done on this side, turn me over.” His last words were a prayer for the conversion of Rome. So moved were some Roman senators that they converted on the spot and carried Laurence’s body to his tomb. In less than sixty years, all Rome and the Empire were converted to Christianity. The intercession of the Deacon Laurence is so much attributed to that conversion that to this day we commemorate August 10 as a feast day, which is the second highest commemoration after a solemnity. Laurence living out his vocation as a deacon described so beautifully in the Roman Catechism, caused the conversion of the greatest nation on Earth at the time, Rome. Sadly, Stephen and Laurence are not widely known in the 21st century, but St. Francis of Assisi, after almost 800 years since his death, still captivates minds and hearts. It would be impossible to go into great detail about Francis in this small essay, but what many do not know is that he was a deacon. They are also unaware that while Francis lived a life of utmost poverty, he also vigorously pushed that only the best vessels, vestments, and linens be used at Mass for His Lord hidden in the Host. Fr. Thompson in his biography on St. Francis states: “The locus of Francis’s ‘mysticism,’ his belief that he could have direct contact with God, was in the Mass, not in nature or even in service to the poor.” Francis was ordained a deacon not because he wanted to preach at Mass, as some biographers claim. In fact, only bishops and priests were allowed to preach at Mass at this time. It should also be noted that for a deacon to preach today at Mass is an exception and not the norm. The norm is still that bishops and priests preach at Mass. Francis felt called to the order of deacon because it is first and foremost an order of service, meaning that deacons are ordained to serve. He firmly believed that the faithful needed to be warned about being attentive to the holy mysteries of the Mass. Francis truly embodied what we see in St. Stephen and St. Laurence. And while Francis did not suffer physical martyrdom, he did suffer spiritual martyrdom manifested physically in the stigmata. What does one see in these small glimpses of the lives of Sts. Stephen, Laurence, and Francis? Men who are full of wisdom who gave their lives totally in service for Christ and His Church. The Second Vatican Council called for their institution of the diaconate as a permanent vocation for men called to this sacred vocation. It also allowed for men who are already married to be ordained a deacon with the consent of their wives. Some dioceses frame the ministry of deacon as a team ministry with his wife—it is not. Some look upon deacons as nothing more than a glorified acolyte (altar server)—they are not. Some think that only part-time learning to become a deacon is needed—it is not. Let the examples of the saints above show us what a deacon is called to be: the eye of the Bishop, who warns the faithful to be attentive to the holy mysteries and looks after the distribution of the goods of the Church, men who are filled with wisdom and willing to give their lives for Christ. This article was written by Fr. JPL, a contributor to this site. The Roman Catechism: The Catechism of the Council of Trent (Rockford, Tan Books and Publishers, 1982) 328–329.